Tif1γ (Trim33) is an E3 ubiquitin-protein ligase, which promotes SMAD4 ubiquitination, nuclear exclusion and degradation via the ubiquitin proteasome pathway (1, 2). May act as a transcriptional repressor. Inhibits the transcriptional response to TGF-beta/BMP signaling cascade. Plays a role in the control of cell proliferation. Its association with SMAD2 and SMAD3 stimulates erythroid differentiation of hematopoietic stem/progenitor By similarity. Monoubiquitinates SMAD4 and acts as an inhibitor of SMAD4-dependent TGF-beta/BMP signaling cascade (Monoubiquitination of SMAD4 hampers its ability to form a stable complex with activated SMAD2/3 resulting in inhibition of TGF-beta/BMP signaling cascade) (2). Defects in TRIM33 are a cause of thyroid papillary carcinoma (3). Recombinant human N-terminal FLAG tagged Tif1γ was produced in SF9 insect cells, purified using FPLC and formulated in a storage buffer containing 20mM Tris-Cl pH 7.6, 1mM EDTA, 0.15 M NaCl, 10% glycerol, 0.5mM PMSF and 1mM DTT. Protein concentration was determined by spectrometry. >95% purity by SDS-PAGE. SDS-PAGE gel of recombinant FLAG tagged Tif1α (Lane 2). Lane 1, protein molecular weight marker. 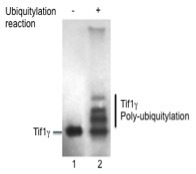 SDS-PAGE gel of recombinant auto-ubiquitylated Tif1γ (Lane 2). Lane 1, recombinant FLAG Tagged Tif1γ. Tif1γ modification with ubiquitin (Ub) was reconstituted in vitro in the presence of recombinant E1, E2, Ub and ATP. Tif1γ auto-ubquitylation results in a mobility shift of 8kDa. The efficiency of in vitro auto-ubiquitylation is evaluated by 8% Tris Glycine SDS-PAGE.